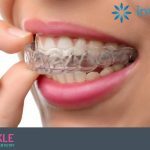 Invisalign is one of the best solutions for people who don’t want to wear “regular” braces and would like to have a clear smile for certain occasions. The system is based on a series of “aligners” made of clear plastic, that can be removed from the teeth and then placed back again. A very elegant solution, that’s for sure. So, the best solution is to have it on as much as possible. Keeping my Invisalign on for as much as I could (small 3-4 minute breaks to brush my teeth and a few minutes to eat), made my treatment super-easy and pleasant. My teeth got so used to the “plastic” that, when changing the tray every 2 weeks with a new one, made me pass the moment with little to no discomfort at all. Instead of being sore for at least 2 hours, I’d just pop the new one and have a big smile on my face.